My friend Maureen and I went back to Warren’s Blackboard restaurant tonight. It was just as amazing as the first time and I almost ordered all of the same things I had before but decided to mix it up, starting with a drink. Pineapple Jalepeno Margarita. Can I just say I never want a regular margarita ever again? 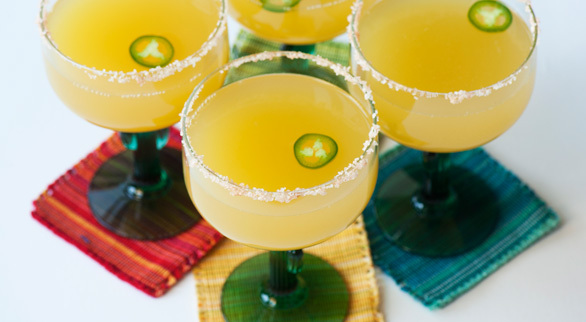 The pineapple gave it sweetness, the jalapeno gave it a little bit of bite, and the tequila and fresh lime juice made it blend all together perfectly. Very happy with my selection. FYI: I’m seeing Dr. Wile E. Coyote tomorrow for my second opinion about the spot. I’ll let you know. I’ve had a rough day. I won’t bore you with the details, but sufficed to say that my Differently today involved stopping at the liquor store on the way home where I bought a bunch of random booze to try in different drinks tonight. Included is something called OM (Organic Mixology) which is sort of a fruity liquor that’s not exactly good but not terrible, and Chambord, and Midori. Based on my booze choices, apparently I’m a 25 year old girl. Two shocking admissions…. 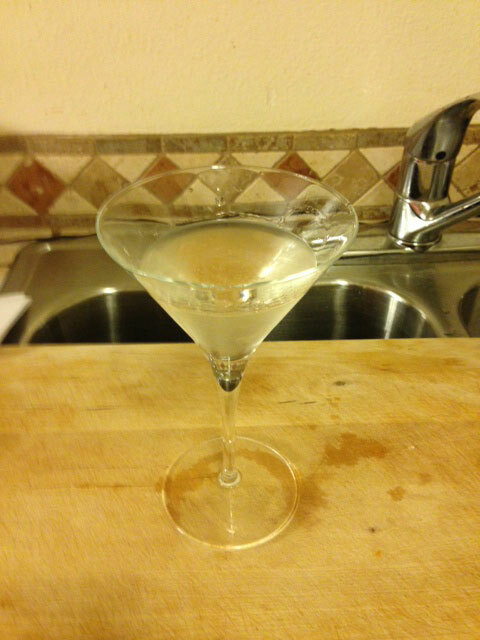 I am 47 years old but have never owned a proper set of martini glasses and, although I made them for others when I was a bartender, have never made myself a proper vodka martini. Both of those egregious oversights have been corrected. Please don’t give me crap about the lack of an olive. Why take up room where more alcohol could be with something silly like a garnish? I was a bartender for a while back in the early 1990s. It was at a little bar in The Valley called The Apache that was very popular at that time. The main bar, up at the front of the club, was where the hot bartenders worked; you know, the ones that would go shirtless and flex their pecs and get the big tips (and I meant money, you perv, although… ). I worked at the back bar. Well… “bar” is probably being generous. It was more of a counter by the bathroom that doubled as coat check whenever it got chilly and had an odd aroma emanating from somewhere in the walls whenever it got warm. I did not take my shirt off but never admitted it was because I didn’t have the body to support it. I said it was because I was unwilling to stoop to cheap theatrics to get customers. I had my principles, you know. It’s a gay bar in The Valley. Of course, I have Madonna. But I digress. I did invent a cocktail, of sorts while I was slinging drinks. Actually it was more of a drinking game than a cocktail, but it was called the $3 shot. Behind the bar/counter/coat check window were three shelves of liquor, arranged in no particular order or strategy. The drink involved taking three dollar bills and placing them on the bar face up and then putting a shot glass next to them. The customer would read off the first number of the serial number of the first bill and then I would count over that many bottles on the first shelf. So for instance if the first number on the bill was a four, I’d count over four bottles and then pour 1/3 of a shot. Then we’d move to the second bill, second shelf, and another 1/3 of a shot and then the third bill, third shelf, and the final 1/3 of a shot. So basically you’d wind up with three different kinds of alcohol, completely at random, mixed together into one shot glass. You could wind up with something fairly inoffensive like, say, vodka, Midori, and triple sec or you could wind up with something like Johnny Walker Red, gin, and butterscotch schnapps. “Shut up and drink it” was the popular refrain. Rick Garman: proudly promoting alcohol poisoning since 1991. Anywho, I decided I wanted a drink tonight but didn’t feel like going out to get one, so I broke out a mini-blender my parents bought me when it was unclear how soon I’d be able to go back to solid food after my surgery, and I whipped up a couple of new drink inventions. I may not have actually come up with anything new here, but I didn’t look up recipes – I just started pouring – so I am claiming them. The first, pictured below, involves lemonade, vodka, triple sec, and ice blended together – I’m calling it Frozen Spiked Lemonade. It’s awfully darned yummy but I think the next time I try it I’m going to add a little something-something – Frozen Spiked Strawberry Lemonade! Cocky from my success, I decided to push my luck and the boundaries of good taste. I wanted something like a mint chocolate vodka martini/white Russian type of a thing, which sounded really good in my head, but the only way I could approximate the concept was to put vodka, milk, ice, and a handful of mint truffle Hershey’s kisses in the blender. Let’s just say “no” and leave it at that. 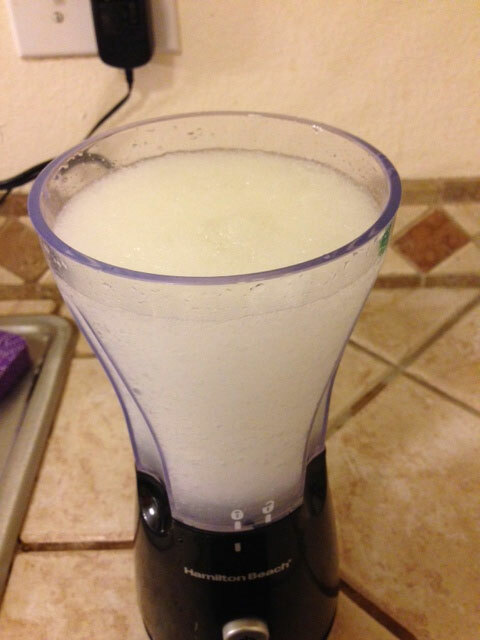 But I’m telling you… Frozen Spiked Lemonade this summer for your next backyard barbecue. You’re welcome.